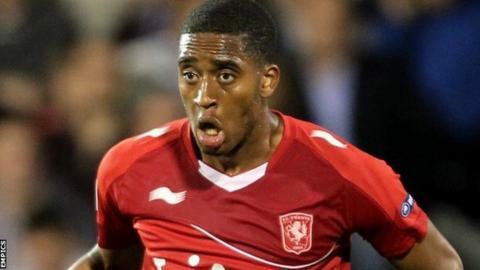 Everton are threatening to pull out of an £8.6m deal for Leroy Fer after his medical revealed a problem with the FC Twente midfielder's knee. The 23-year-old arrived on Merseyside on Tuesday hoping to complete his move, but it is now in danger of collapse. Everton are still prepared to pay the full fee for the Dutch international. But they want to restructure the deal based on appearances or other clauses guaranteed to insure them against a recurrence of his knee problem. Fer has now returned to Holland while the two clubs hold further talks. Everton have warned FC Twente they must accept the renegotiated terms before kick-off in Wednesday's Premier League game against West Bromwich Albion (19:45 GMT) or they will turn their attentions elsewhere. FC Twente have so far refused to accept any alterations to the terms of the deal leaving Fer, who missed almost two months of the Eredivisie season after sustaining the knee injury on international duty in September, in limbo. The Dutch club's chairman Joop Munsterman told De Telegraaf: "Everton have additional requirements on the method of payment. Here we do not agree so it's stuck. "We don't play that game here at Twente. They can come up with any demand they wish but we're not playing along with their demands."